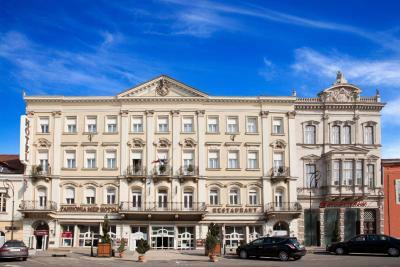 Lock in a great price for Pannonia Hotel – rated 8.6 by recent guests! Great selection of food. Aside from the coffee machines there is a coffee barrister prepared to make coffee and he does it with great artistic care. For dinner the chef went out of his way to prepare a gluten free main course and desert. Amazing staff. Very friendly, genuinely attentive and helpful. The pool. Wellness was nice, just closed too early. The location of the hotel right at the brink of the old city is excellent. The hotel offers a guarded car garage with Tesla destination chargers at 11 euro a night. The restaurant has good food. We particularly liked the local dishes, e.g. Mangalica-pork. The house red wine is good at a reasonable price. 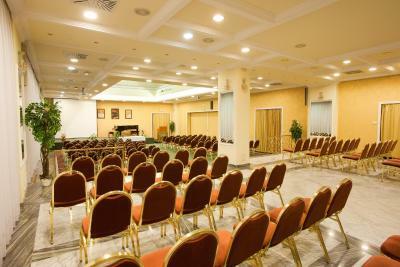 We booked the better category room with air conditioning at a discount price including breakfast. Dinner with wine was as expensive as the room. The room was excellent: newly furnished and clean. The hotel facilities are numerous, e.g a wonderful roof terrace landscape with great views of Sopron and a small spa. Breakfast had plenty of choices and was good. Excellent hotel! Great value for money. Excellent breakfast, nice personnel, incredible services. We locked our bikes in the hotel garage, very nice! The location was great. We had a lovely evening with a bottle of wine on the rooftop overlooking the city. Pannonia Hotel This rating is a reflection of how the property compares to the industry standard when it comes to price, facilities and services available. It's based on a self-evaluation by the property. Use this rating to help choose your stay! 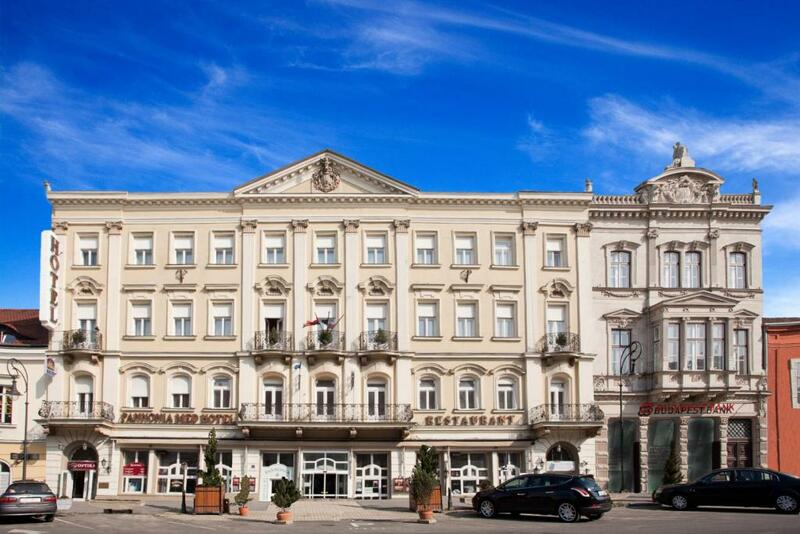 Located in the heart of the historic town, this hotel, built in 1893, is the oldest in Sopron. It offers a fusion of traditional and modern hospitality. Free WiFi and a wellness area with a swimming pool, a whirlpool, a bio sauna, an infrared sauna, a Finnish sauna, a salt room and a steam bath are provided. Guests can make use of a private garage for an additional fee. The hotel consists of individually furnished rooms with a flat-screen TV, a mini-bar and a bathroom.Some are equipped with antique furniture. In summer the hotel opens its terrace and roof-garden with sunbathing terrace. There is also a restaurant offering a buffet breakfast and a 3-course dinner option. Guests can enjoy the café open during the day. Close to the Austrian border and one hour’s drive from Vienna (43 mi), the hotel lies west of Budapest (137 mi). During your stay you can explore the old town center of Sopron, rich in monuments. This property also has one of the top-rated locations in Sopron! Guests are happier about it compared to other properties in the area. When would you like to stay at Pannonia Hotel? The simply furnished room features a mini-bar, a flat-screen TV and a private bathroom. Private parking is available on site (reservation is needed) and costs EUR 11 per day. This air-conditioned room features a sitting area, a flat-screen TV and a private bathroom. The room with classical-style wooden furnishings features a mini-bar, a flat-screen TV and a private bathroom. This standard quadruple room features 2 bedrooms, a flat-screen TV and a bathroom. This twin/double room features a cable TV, mini-bar and bathrobe. 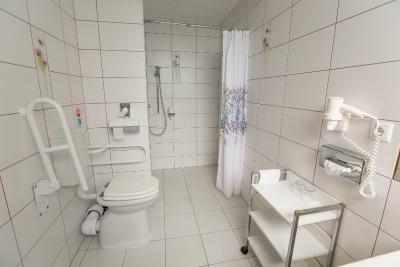 This room features a bathroom with a shower, a TV and a safe. 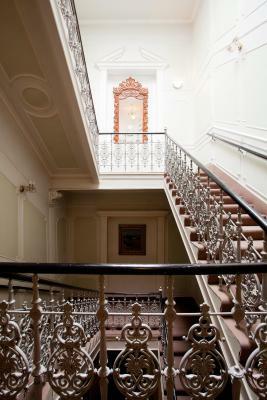 The room is accessible via stairs. We are a centrally located hotel, the best one (which has complex service in Sopron, like indoor wellness) based on guest reviews. Everything is close, since we are the city centre, but you can also relax in a very special environment misxing modernity and the Monarch times. House Rules Pannonia Hotel takes special requests – add in the next step! Debit card Pannonia Hotel accepts these cards and reserves the right to temporarily hold an amount prior to arrival. Pannonia Hotel accepts these cards and reserves the right to temporarily hold an amount prior to arrival. Please note that the price of the extra bed does not include half board service. Please contact the hotel, if you want to add half board service for guests staying in extra beds. Pets can be accommodated at an additional cost of EUR 16 per night. In case of booking 10 or more rooms, different policies may apply. Please request parking spot and dinner in advance. Despite paying more than last time we received worse room and we didn´t receive welcome drink according to heir assertion that we had room of lower level (despite paying more). Bathroom was quite worn this time. We stayed here for sixth time and we liked it as well as the previous stays. 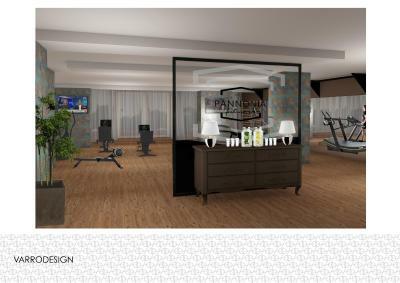 Wellness was pleasant as usually and the gym was renovated in comparison with our last visit so we were pleased by spending more time in there. The bathroom could use a slight renovation. Room temperature can be an issue during hot summer, I imagine. Fantastic atmosphere. The hotel occupies one of those hundreds of old town buildings in Sopron so it somewhat takes you few decades back. The interiors are rather aged, which can be a great thing if you don't mind taking a break from your typical modern B&B. 5-star breakfast with lots of hot meals to choose from. Location near countless lovely cafes, restaurants, shops, etc. Lack of general refit since approximately 30-40 years, really old and exploited facility. No WiFi in the room. The friendliness of the staff, the quality of the rooms and the wellness area were all amazing. The breakfast (included) was diverse and delicious, and the half-board catering had amazing dishes as well. When a person comes for leisure , massage, hair and nail person should be available at least till 8 pm. Its a service industry. Between 9 to 5 is kind of office work. That would make Panonia better. Breakfast, barely warm, little choice. 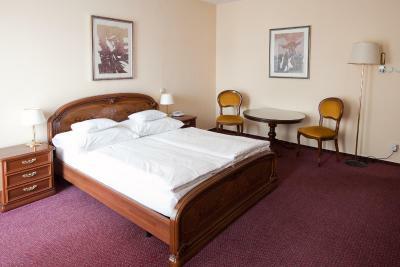 I very much like this hotel - it provides very comfortable service for very reasonable money. It was almost a perfect stay...but..we wanted to have a bath and bathtub had no stopper. I asked reception to get me one and they couldn't, because it was late and no housekeeper at the hotel...They apologized.. The wellness area could have been ventilated a bit better but this is the case in all indoor pools and spas. The pool could have been a bit bigger. 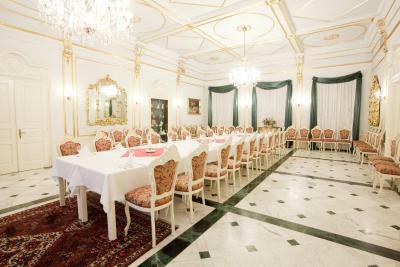 Marvellous hotel in classical style, breakfast in the marble courtyard, huge halls with paintings, mirrors..The room was spacious and tastefully decorated, the lighting was perfect. We enjoyed the balcony with the romantic, forged iron parapet. All staff were very friendly, the wellness area was really nice. We were treated with a welcome drink. Outside of the hotel is nice but inside it needs some renovation. Room has broken connector, raunchy towel, stained carpet, old/dirty wallpaper. This hotel is in the center of Sopron, 33 EUR with breakfast was an acceptable price. Wellness and fitness is also incl the price.